“In a small business, money is often seen as the scarcest resource, and for good reason: It’s the grease that keeps the machine running. But if we take a step back for a minute—a hard thing for a business owner to do—it’s easier to see that time is truly our scarcest resource. It’s fixed and it’s finite. and we’ll never get more. We can’t ignore the power of using it correctly, or the tragedy of wasting it“. Most of us have likely heard at least a variation of the “Big Rocks” principle made famous by author and educator Stephen Covey in his book,First Things First. The Big Rocks principle says that you choose a few “big rocks” each day to work on first, so you’re sure to get the important stuff done. The rest of your time can be used for smaller tasks to fill out the day. (Here’s a visual representation of the concept.) It’s how you ensure you’re always getting the critical things completed. But while everyone may understand this concept, it takes great discipline to actually follow the principle. For many of us small-business owners, this idea seems like a pie-In-the-sky concept. That’s because owning a business is often a lot like taking care of small children. Anyone who has children under the age of 4 knows that their day is filled with making sure things aren’t accidentally swallowed, responding to crying, kissing boo-boos, making and cleaning up meals, monitoring potty time and all the other activities that have to happen immediately. With kids, nearly everything is urgent. Small businesses aren’t much different. Unlike a huge company with specialized departments, you’re probably the customer support, IT department, product development and marketing department all wrapped into one. Every day is an adventure, to say the least. Unfortunately, this means you’ll likely encounter many fires throughout your day. And it’s amazing how we’ve grown accustomed to the constant distractions—we’re only working at a fraction of our potential in this distracted state, and it’s sad. In a small business, money is often seen as the scarcest resource, and for good reason: It’s the grease that keeps the machine running. But if we take a step back for a minute—a hard thing for a business owner to do—it’s easier to see that time is truly our scarcest resource. It’s fixed and it’s finite. and we’ll never get more. We can’t ignore the power of using it correctly, or the tragedy of wasting it. 1. Do the big things first. While this is the most obvious, you wouldn’t believe how hard it is to actually work on the meaningful stuff during the first part of our day. There’s pressure to check email, reply to texts, check the sales reports, and on and on. Do the important work first—everything else can wait. 2. Change your perception. The first step to clearing space for the big rocks is to modify how we perceive urgency. Most problems in time management arise from what we perceive as urgent versus what is actually urgent. 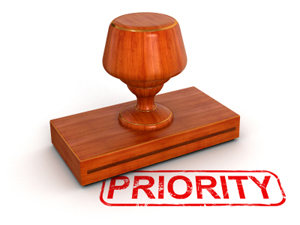 If you work with clients, you know that clients will often try to make nearly everything urgent. But urgent things steal control of our day. Learning to respond only to the truly urgent problems and working first on what you deem are the most critical tasks means you’re taking back control of your day. 3. Create a plan. I used to just plow through my day, working on whatever jumped out at me first. The problem with that approach is that I lost all control of my day. Instead of just winging it, write down your plan every day and keep it near you, open and right in front of you. It doesn’t have to be complicated—it can be as simple as just making a list of your big rocks. Just make sure that it’s always visible, reminding you of what’s important. And even if you don’t follow your daily plan to the letter, you’re going to get close, and close is better than nothing at all. 5. Turn off the distractions. As our world slowly turns into a giant push notification, it becomes harder and harder to ignore all the things stopping us from handling our big rocks. But here’s what needs to happen: To accomplish your goals, you’ll have to put your phone on silent (or “Airplane” mode to eliminate all distractions), close your email and turn off those notifications. If you can do this while you’re working on your big rocks, you’ll see unbelievable gains in your productivity. When you can fully focus on the tasks in front of you, you’ll do your best work. If you truly feel like you just can’t disconnect due to business reasons, then another option is to work on your big rocks at odd hours, like very early in the morning or late at night when things quiet down. This allows you to take advantage of the fact that not many people call, email or text in those off hours. Being a small-business owner means you have lots of distractions and urgent things to work on throughout the day. But it doesn’t mean they have to control you. Take back some of that control, and learn to work on the important things first. Your to-do list will thank you.